With an early Thanksgiving just around the corner and holiday music already playing on the radio, it feels like the next few weeks are about to fly by in a whirlwind of vacation days, pumpkin pies, and jingle bells. Here at TFALC, we’ve tried to slow down and spend some time thinking about what we are grateful for this holiday season. It turns out many of us are grateful for the same things: our families, our friends, and our students! Having a time set aside for giving thanks is a helpful reminder to make gratitude part of our lifestyle year-round. When we intentionally think through what we appreciate, we tend to become happier and more optimistic. In fact, research on gratitude links it with improved emotional, mental, and physical states. Brain scans of people who practiced gratitude for eight weeks revealed that they built stronger mental structures for social cognition, empathy, and reward processing. When we work on being grateful, we equip our brains for more meaningful interactions with those around us. At the same time, our strengthened reward center gives us positive feedback, making us happier and more productive. 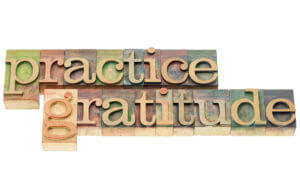 Practicing gratitude also leads to greater attentiveness, persistence, and energy. This means that we work more efficiently and effectively when we take the time to feel and express gratitude. Other research even connects gratitude to exercising more and going to the doctor less. We can all benefit from practicing gratitude as we work towards our goals. Keep a daily or weekly gratitude journal. Put a sticky note reminder on your desk or mirror (e.g. “I’m grateful for…”). Write a thank you letter each month to someone who has positively impacted you. At the dinner table, have each family member share something he/she is grateful for.